A few years ago I saw one of those quick "catch a celebrity getting into his car" video clips on TMZ.com in which NBA legend Shaquille O'Neal walked out of a restaurant and wished all his Jewish friends a L'shanah Tovah. It was right before Rosh Hashanah and it was circulated pretty quickly around the Web. I had forgotten about that video when I asked Shaq to say "Shabbat Shalom" into my cellphone yesterday. My friend and fellow native Detroiter Lisa Lis got me hooked on video recording celebs saying those two Hebrew words a couple years ago and I've already collected several which I uploaded to my YouTube.com channel. Yesterday at CES in Las Vegas I heard a wonderful interview with Russell Simmons, the Hip Hop pioneer and entrepreneur. After the interview he graciously offered a "Shabbat Shalom". After meeting Russell, who is the president of the Foundation for Ethnic Understanding along with Rabbi Marc Schneier who serves as chairman, I had the opportunity to meet Curtis Jackson, better known as 50 Cent. Something told me that he wouldn't be so into saying Shabbat Shalom, but Shaq was more than willing. In fact, he took the time to ask me what "Shabbat Shalom" means and when it's appropriate to say it. He even surprised me with some other Hebrew phrases ("Baruch Hashem" and "L'shanah Tovah"). 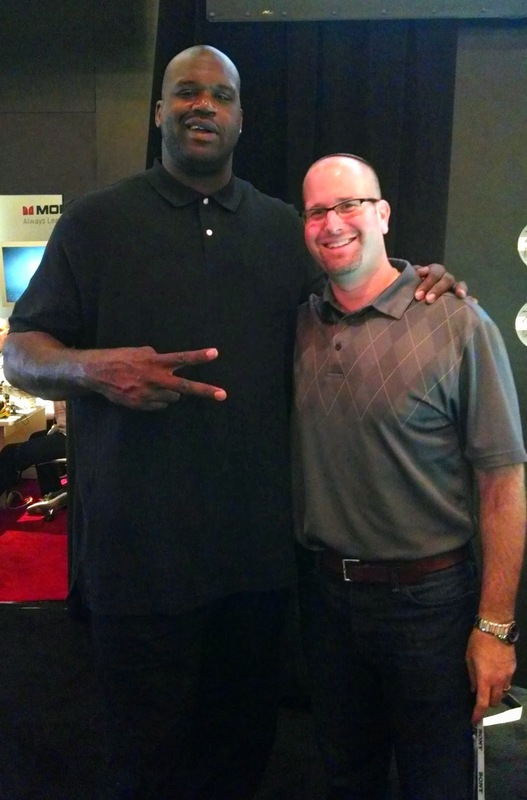 Shaq and I shmoozed for a while inside the Monster booth at CES. When he saw the large American Express bag I was carrying with me, he asked where I got it because he needed a large bag to carry his gifts from Monster. I gave him the bag and in return he presented with me a nice pair of Monster DNA Pro headphones. A great deal! I suppose had I gotten 50 Cent to say "Shabbat Shalom" on video it would have been the triple trifecta of Shabbat Shalom greetings in one day from three uber-successful entrepreneurs in the African American community. All three gentlemen struck me as very impressive, nice guys who are each doing great things to promote technology and entertainment in the 21st century.